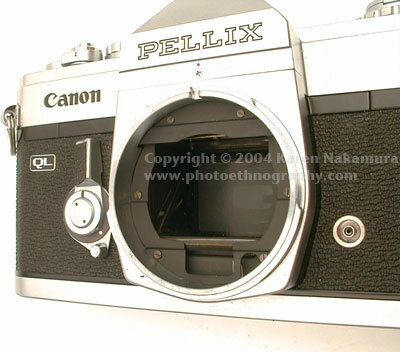 The Canon R lens mount was introduced with the Canonflex in May of 1959. It was a breechlock (or spigot-mount) lens unlike most other mounts, which are either bayonet mount or screw mount. The advantage of breechlock-mount is that the lens-body mating surfaces do not slide against each other when mounting. This means that lens-body mounting wear can never degrade the optical performance (in reality, though this is a neglible issue since most uers don't change lenses often enough to wear these surfaces). The disadvantage is that the breechlock is "fussy" - it's hard to quickly mount an FL/FD lens in a rush without practice. The R mount was revised in 1964 into the FL mount with the Canon FX. A new type of aperture-linkage was added. This allowed for TTL metering and opened up the diaphragm to full-aperture after the photograph was taken. Using the text or images on this website without permission on an ebay auction or any other site is a violation of federal law. 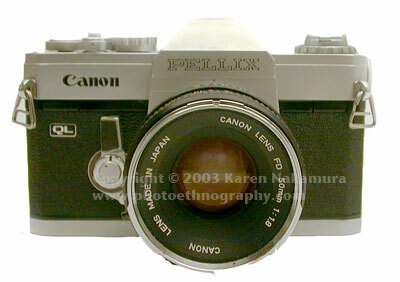 The FD mount was introduced in 1971 with the introduction of the Canon F-1 and FTb. The lens mount allowed for fully-coupled auto-exposure metering. Around 1973, Canon started a new multi-coating process called SSC or Super-Spectra Coating. Lenses starting around 1971 were marked with SSC on the lens barrel. 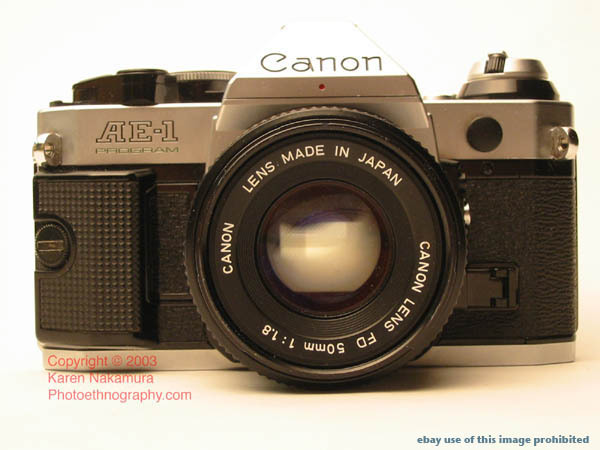 The "New FD" mount was introduced in 1976 with the Canon AE-1. I am not sure what changed, although the lenses mostly moved to plastic bodies rather than metal bodies. Since almost all lenses were being multi-coated, many of the new FD lenses are not marked SSC anymore. Subject: Correction to your "Canon R/FD/FL Breechlock Mount Lenses" page. On your page on "Canon R/FD/FL Breechlock Mount Lenses" you state, "The 'New FD' mount was introduced in 1976 with the Canon AE-1. I am not sure what changed." everyone else's lenses. The mounting surfaces still remain still against each other, but the rest of the lens turns - in effect, the whole lens barrel is now the 'locking ring'. I imagine Canon did this because they found that photographers liked the mounting method of everyone else's lenses more than Canon's. That the bayonet mount was better, despite Canon's defense of the breechlock mount, is proven by Canon changing to bayonet for EOS in '87. The R/FD/FL lens mount has three outer bayonet lugs (for the breechlocking action). The mount inner diameter is 48mm with a flangeback of 42mm, which is one of the thinnest flangebacks. This makes it easy to adapt almost any lens to Canon R/FD/FL mount, but very difficult to use Canon R/FD/FL lenses on any other camera. Using the text or images on this website without permission on an ebay auction or any other site is a violation of federal law. Even the Canon EOS series cannot accept FD lenses easily because their flangeback distance is greater. Either you have to give up infinity focus or you have to use an adaptor with a negative lens element in it, which reduces optical quality as well as compatibility with the entire FD line. This annoyed many FD photographers greatly when migrating to the EF/EOS system (and gave Nikon users something to chortle about). 9 elements in 8 groups ?